Keeping your curls off your neck in the heat is essential to keeping cool in the summer time. Essence Music Festival attendees had beautifully creative braided and twisted styles to keep their hair up and off their shoulders. Here are a few favorites. I first saw this gorgeous braided updo on Day 2 of the festival and ran into her again on Day 3 with the front twists taken out. 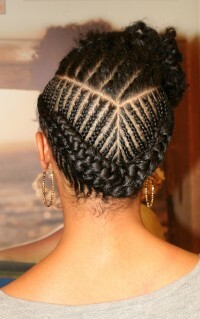 I loved how this 'do has almost an infinite amount of styles within a style. 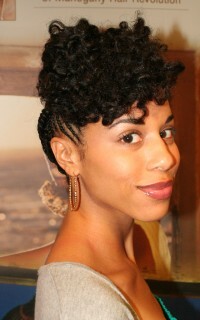 If you braid up the back and leave the front loose, you can twist, roll, bouffant, and bantu knot your heart out! The possibilities are endless. 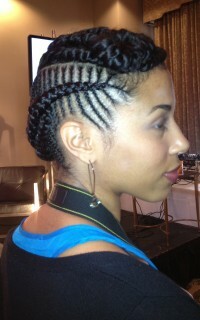 Hats off to Dr. Kari Williams of Mahogany Hair Revolution for creating this fabulous style! View from the side on with a twisted top piece. With the front twists let loose. Gorgeous. Twisted Up, Up, and Away! 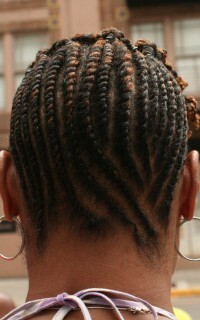 This is a similar style that uses a combination of flat twists and two strand twists instead of braids. 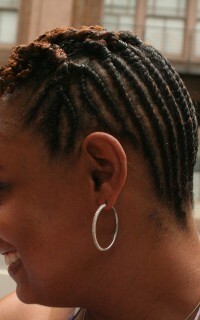 The flat twists begin at the nape of the neck and bottom of the edges and continue up towards the crown of the hair where they are then two strand twisted. 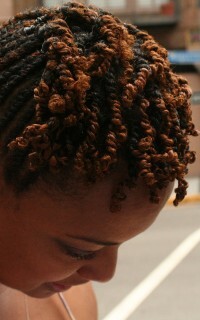 To get her two strand twists to coil, she applies a bit of gel and twirls around her finger for definition. If you're rocking braids as a protective style this summer, be sure to check out this interview with Dr. Kari Williams where she explains how to keep braids hydrated in healthy. More more coverage from Essence Music Festival, visit here!